The TSC TTP-244 is based on the best selling TTP-244 platform, features such as legendary Dual-Motor design, and industrial standard media capacity. With its small, compact footprint, it is perfect for a variety of label and tag printing applications. 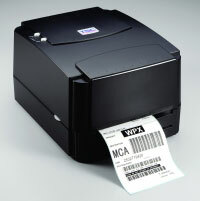 The TTP-244 can print a wide variety of labels ranging from low volume shipping labels to compliance and general purpose product identification labels and tags.